Corresponds to the specified value. The tolerance range may be used to reduce the difference in wheel load. 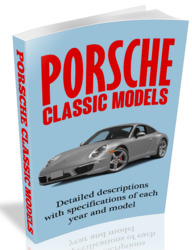 • Should be within the tolerance range for the specified vehicle height. • Is lost if the vehicle or front axle have been raised. • Is recovered after a longer journey or longer operating period. Exact value can be achieved by pulling the front axle downward in a precisely defined way. ■ Description in the following text. 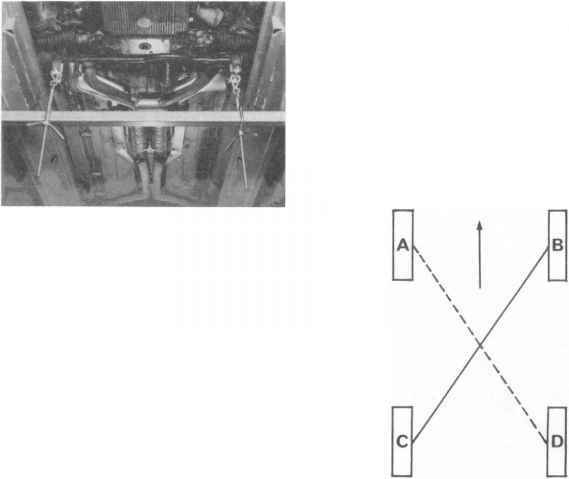 a) a result of height measurement that does not correspond to the actual vehicle height, or b) a toe-in value, when correcting the wheel position, which, because of the FA kinematics, does not comply with regulations at actual vehicle height. After the vehicle has been raised, starting at the influenced vehicle height, pull the front axle down by 60 - 70 mm and hold for 1 minute. Use special tool 10 - 222 A for this. Keep to the specified time. After releasing the vehicle, bounce the front and rear axles -approx. 25 mm - a few times. 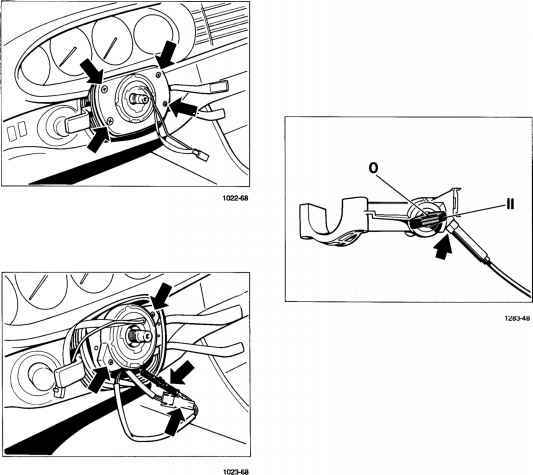 For the pulling down procedure, fasten the engine support (prop device) 10-222 A to the stabilizer. Use suitable hooks or straps. The transport lugs (strap No. 28, Page 40 - 7) may be used if there is enough distance between the rails of the platform. This is possible without removing the sump guard. An alteration in wheel load always acts on the wheel diagonally opposite. In other words, if the wheel load of one wheel is Increased or reduced, the diagonally opposite wheel undergoes the same alteration. An increase in spring pretension (raising the vehicle) on one side causes an increase in wheel load.